The Chenille Cuddler is as simple as it is pretty. 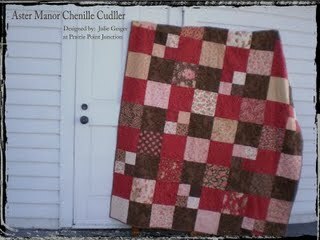 I just couldn’t resist the gorgeous chenille in the Aster Manor line. It sure elevates simple squares from blah – to – ta dah! This entry was posted on Tuesday, December 8th, 2009 at 1:42 pm and is filed under Uncategorized. You can follow any responses to this entry through the RSS 2.0 feed. You can leave a response, or trackback from your own site.